October 2, 2017 by Mary Stevenson, Vedic Astrologer, www.ethereal-grain.flywheelsites.com 928-284-4060. Thank you for sharing this post with anyone who may find it of interest. Autumn greetings to you all, from a chilly and rainy Boulder, Colorado. I hope you are feeling blessed as this new season arrives. Let’s go right to the main attraction of planet movements this month, since this event occurs only every 2.5 years. 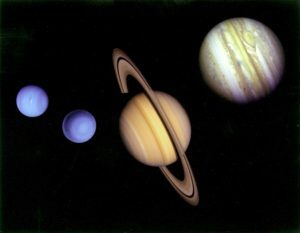 10/26 – SATURN MOVES INTO SAGITTARIUS! My many friends with Moon in Scorpio will be so glad to feel that weight lifting off of them, after its 2.5 year stay in that sign. Oh, Saturn briefly entered Sagittarius earlier, from 1/26 to 6/20 but then went retrograde to once again tap dance on the Scorpio Moon minds and hearts, which the Moon represents. It will be a blessed relief for those of you with a natal Scorpio Moon to finally go into the last third of your 7.5 year Sadhe Sati period, i.e. just not as intense for you. So what about us?, you Sag Moon people are thinking, yes? Well, at least Saturn rules your second house of wealth, so can bring some money to you — but it will be the hard way, through work and service, and you can expect it to come with delays, snags and obstacles. If your natal Moon is in Sagittarius, you may also experience some grief during the next few years. Sometimes that is not related to anything going on in the outer world. This placement can simply bring internal angst and feelings of isolation, etc. Sadhe Sati gives an opportunity to look deep within at what really matters in this life, and become more detached and philosophical. Try to use this period to your advantage, in terms of spiritual growth. 10/09 – VENUS enters Virgo. It is in this Earth sign that Venus experiences debilitation, i.e. not as strong here. Thus the signs it rules, Taurus and Libra, will not feel as robust as usual, perhaps. Especially for the Libras, it is not such a good placement as Virgo represents your twelfth house of loss, expenditure and isolation. But it can be a good time to go inward and perhaps attend a meditation course or retreat. For Taureans, it is a good house placement at least, as the fifth house connects you to children, lovers, success in the relative world or speculative matters, plus education. 10/12 – JUPITER goes combust the Sun. This great benefic recently entered the air sign of Libra (on 9/11). It rules the sign of Pisces, so this placement in the Pisceans’ eighth house can bring vulnerability on the physical level and transformation. Parts of life as you knew it will undergo changes, ready or not, Pisces friends. For the Sagittarians, the other sign it rules, this placement is in your eleventh house of income and gain, so it’s a better scene for you. Take advantage of this placement to ask for a raise, or buy a property, for Jupiter also owns you fourth house of real estate. For the host sign of Libra, well, Jupiter does not rule your best houses. It can bring you some energy, but also some stress and worry. Also, you will have to be careful not to put on extra weight for the year that Jupiter will be in your first house! Being combust the Sun makes a planet more irritable and not able to give its best significations. This condition lasts for Jupiter until November 9th. 10/13 – MARS enters Virgo. Here it joins Venus, the Sun and Mercury. So it’s a four planet party for the Virgos. Mars adds more ambition, energy and action to the mix, but also, since it owns the eighth house for Virgos, some vulnerability. Be careful of doing things too fast, which can lead to accidents. Also try to avoid being more quarrelsome than usual, as Mars can represent anger and irritability. Mars rules Aries and Scorpio. Virgo is the eleventh house of gain and income for the Scorpios so good for you, in that department. For Aries, this represents your sixth house of health problems, stress and worry, so take measures to maintain your health, and meditate for relaxation and to avoid the stress this period may bring. 10/13 – MERCURY also moves a little later on this day, into a friend’s sign, Libra. This is a mixed blessing for the Libras, as governing your ninth house of good luck and good fortune, remedies, pilgrimage and natural law, it can bring those qualities to enjoy in practical ways in your every day life. However, it also governs your twelfth house of loss and expenses. Thus you will have a mutual exchange of houses now, with the lord of your chart, Venus, sitting in the twelfth house and ruler of the twelfth house, Mercury, in your first house of self, body and direction of your life. You can make a lot of spiritual progress now if you focus on that. The other choices are foreign travel or “bed pleasures”! For Geminis, Mercury here is in the fifth house of success, education, children, so it’s a nice placement for you. For Virgo, the other sign ruled by Mercury, this is your second house of family, wealth and communication, so also a good placement. 10/17 – The SUN enters Libra today. This is its sign of debilitation where it is weakest. For the Leos, which the Sun rules, this represents the third house of short journeys, projects, and vitality. It’s not a bad placement and you will still feel fairly ambitious. For the Libras, this planet rules your house of gain, so it can act in a positive fashion to bring you better income or gain of any item for the next month. 10/26 – As discussed above, SATURN ent ers Sagittarius. 10/31 – HAPPY HALLOWEEN! MERCURY goes non-combust the Sun, so Geminis and Virgos will enjoy some relief from that condition, and communication for everyone should improve. Mercury had been combust since September 21. May the planets now bring you many “treats” and fewer tricks!